This term, we are learning about the USA! In literacy, we have been reading 'The Listeners', which is a narrative about slaves in America. We have enjoyed learning about Ella May and debating whether or not the characters' actions were justified. We have also really enjoyed learning about Pocahontas, and the different tribes that lived in America. This information will be very useful when we create our dioramas - any junk modelling from home would be greatly appreciated! In science we are learning about forces. We will use our knowledge of forces when designing our Cam Toys in design technology. The children have already started to think about their USA themed designs for their product. This term, in P.E., we are learning how to play hockey. Please ensure children have their P.E. kits in school on Monday and Thursday, otherwise, they will not be able to participate. Also, please be mindful that the weather is still rather cold, so the children should be equipped with appropriate, warm clothing. Please continue to keep up the good work with home reading. Children should record their daily reading in their purple reading records (they may write in the diaries themselves, but we ask that parents initial it also). Children who do not read four or more times in a week will spend fifteen minutes of their Golden Time reading. Homework club for 5B is held on a Wednesday lunchtime, so if your child has any issues with completing the homework set they can seek my help in this time. This term, we are learning about WWII! In literacy, we have started to learn about Anne Frank in a book we are reading, which is based on the true story of her life. We have been taking it in turns to read, focusing on our expression to make the text exciting; some parts of the story have been so gripping that we have been on the edge of our seats! In history we have been learning about the steps that led to WWII, and have enjoyed creating everyday senarios that help us to relate to Hitler and his actions. We are looking forward to learning more about the countries he invaded, the evacuation process, rationing and much more! We are particularly looking forward to our trip to Kent Life to learn more about WWII! In science and food technology, we are going to be learning about micro-organisms and how they are used in cooking. We will also be making our own soup; just like people did during WWII. This term, we are learning all about The Victorians! In literacy, we have been reading Sherlock Holmes and on Thursday we will be writing our own ending to the book, which ended on a cliffhanger. We have really enjoyed predicting who the murderer might be! Later on in the term, we will be reading Dickens’ A Christmas Carol, which will lead us nicely into our Year 5 and 6 Christmas performance of Bah Humbug! The children have received their parts for the Christmas play and will be working hard over the next few weeks during rehearsals. The performance dates for parents are Monday 3rd December and Tuesday 4th December – we look forward to seeing you all there! Thank you for all the shoeboxes that have already been sent in. We will be using these to create a model of a Victorian room. In art, we will be researching wallpapers designed by William Morris, which will influence our design. Using our knowledge of complex electrical circuits, we will then also be adding light bulbs to our rooms. In our topic lessons, we will be learning about all aspects of life for children in the Victorian era, and on Friday 23rd November we will be having a Victorian day. The children will be required to come to school dressed as a Victorian. This term, in P.E., we are learning how to play golf. In our first lesson we were taught how to putt the ball; our coach said that we were the best class he has ever taught! Please ensure children have their P.E. kits in school on Monday and Thursday, otherwise, they will not be able to participate. Please continue to keep up the good work with home reading. Children should record their daily reading in their purple reading records (they may write in the diaries themselves, but we ask that parents initial it also). Children reading regularly, five times or more in a week will receive rewards! If you are interested in finding out what the children will be learning about in Year 5, then please join us on Thursday 20th September 2018, at 3pm, for a short meeting. There will be an opportunity for you to find out about the different topics that the children will be learning about, along with their home learning projects and school trips. You will also be able to ask any questions that you might have. The children will learn about different types of extreme weather, in different climate zones, across the world. Here is our 'Extreme Weather' display, which the children helped design and create! All of our learning this term is typically inspired by extreme weather. In literacy, we are studying the book Hurricane, which the children will be deriving their first piece of narrative writing from. 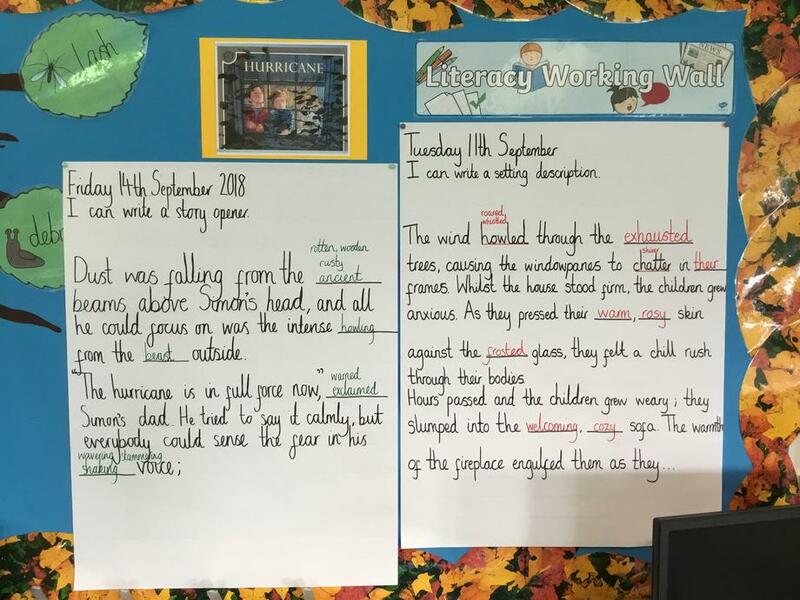 Take a look at our literacy working wall to see our descriptive writing. In art and D.T. we will be learning about Monet, who was an impressionist artist. The children will be creating their own weather inspired artworks, focusing on Monet's style and techniques. In music, the children have already begun to compose their own piece of music, about a particular weather of their choice, using a variety of percussion instruments. They are in the process of creating a graphic musical score in order to record their compositions and will be performing them in a few weeks time. In science, the children have been learning about the life cycles of mammals, amphibians, birds, and insects. Over the next few weeks, they will also be investigating the life cycles of plants. 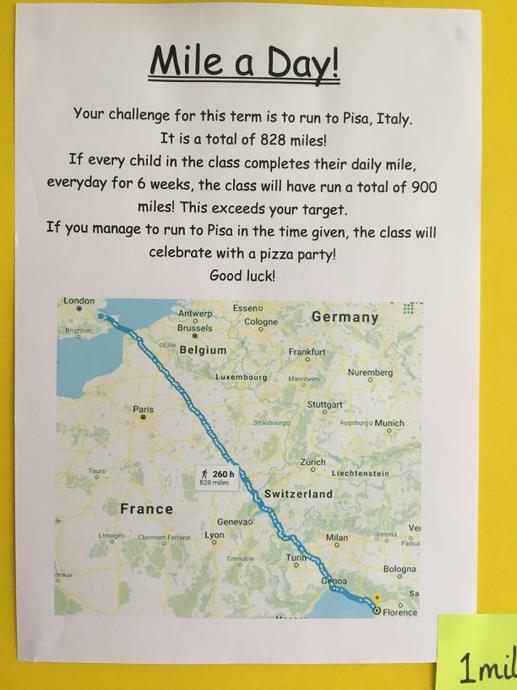 A new fitness regime that Grove Park Primary School has embarked on this academic year is 'The Daily Mile'. The aim of The Daily Mile is to improve children's physical, social, emotional and mental health and wellbeing. The children are given 15 minutes, every day, to run, jog or walk around the school playground or field. This term our PE days are Monday and Friday so please ensure that your child has their PE kit in school. This should include outdoor footwear and warm clothing for the winter months. Year 5 also have the opportunity to take part in Golden Time football on a Friday afternoon; they will need a suitable kit for this too! Home learning will be given out each week; with literacy coming home on a Monday (due back the following Monday) and numeracy coming home each Friday (due back the following Friday). We have reminded the children that all adults in the classroom are available to help with this, should they need it, so please encourage them to speak to us before the homework deadline if they need any extra support. Your child will also be provided with a reading record. It is important that they record their daily reading in this (they may write in the diaries themselves, but we ask that parents initial it please). Children regularly reading five times or more in a week will receive rewards.